This is more like a reminder. I have often talked about the glo Bumpa plan on this blog via some posts and I still want to talk about it here and this is basically because, I want you to enjoy what I am enjoying when it comes to mobile and network services in Nigeria. Let me start by pointing this out, if you are using your glo sim basically for glo blackberry subscription and you are not on the glo Bumpa plan, then you are seriously missing a great deal. Please note: I said if you are using your glo sim basically for Internet Subscription. If you use your glo sim for basically making calls, I won’t advise the glo Bumpa plan. Glo Bumpa plan tariff is relatively very high. Imagine being charged 0.50kobo per second which will equal to N30 per minute. Isn’t that too expensive when you can make a call for as low as N10 per minute on other plans? Why Advising Glo Bumpa Plan For Internet Subscribers? Good question! And I will explain why. If you are on the glo Bumpa plan, you get 200% of every recharge you make. Now, we should know by now that glo monthly bis subscription costs just N1000 and it works on all blackberry phones including bb10 devices. If on the glo Bumpa plan, you will get 200% of your N1000 recharge. 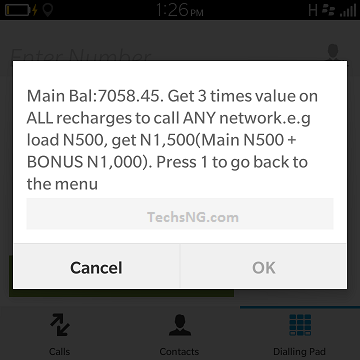 That is, N2000 free Bumpa credit and N1000 main credit. If you then subscribe to glo bis with your N1000, you still have N2000 free Bumpa credit which you can use in calling all networks anytime of the day. It’s more like getting your subscription money back. Isn’t that awesome? Hope you now get the gist? But like I stated earlier, call rates are charged at 50kobo per second. I don’t think that should be a bother to you. After all, with the N2000 free credit, you’d get about 66 minutes of talk time with which you can use in calling any network. How Do I Migrate to Glo Bumpa Plan? If this plan sounds appealing to you like it does to me, dial *100*10*1# to migrate to glo Bumpa plan. Extra Tip: You can stock up credit on your glo line and keep flexing free credit for calls and text messages. Just keep recharging as soon as it seems your Bumpa credit will soon be exhausted. It’s through that medium, I was able to stock up N7000 on my line as seen on the screen shot above while flexing Bumpa credit. Hi, pls how can I use the bis 3g for 1000 naira on android? Onyiii, you would have to change the IMEI of the android phone to a blackberry imei. Dial *100*10*1# and if asked for confirmation, press 1. Thanks sir but can the free credit be use to subscribe to data plan? That i haven’t actually tried out. Wouldn’t want to say things am not sure of. Hope you understand?